Boat owners anxiously waiting to get their vessel out of storage and back in use, each Spring. The boat comes out in the spring, plays during the summer, and inevitably is put into hibernation/layup during the cold winter months. Maintaining your boat is a constant process. It takes a little work to winterize and then de-winterize your boat. It may be tedious, but it's necessary to your machine's longevity and your savings when done properly. Before we dive into our quick tips, all boats and engines are a little different / unique. These steps are a guide and you should consult consult your owner's manual for specific and in-depth instructions. A quick note: we assume that you've done all of the necessary work to winterize your boat before storing it. Without those steps completed, the advice we give here may not work for you. In other words, make sure you're not putting the cart before the horse—winterizing and de-winterizing your boat are connected processes. The typical battery life for a boat is 4-5 years. Re-fill the battery with fresh distilled water and check the charge. You may have stored it indoors and on a trickle charger all winter, if so you may be way ahead of the game. If the battery still holds a strong charge (under a battery tester), then you're in good shape. Next, remove the wires from the charge posts and scrub each post clean of dirt, corrosion and rust. A small wire brush should do the trick. Finally, coat the posts in lithium grease to protect them from further erosion. Seen a lot of folks forget this step only to be sitting at the launch and unable to start their boat. Test all the switches, knobs, and electrical equipment on the boat. Flip the switches on the helm and cabin, being sure not to skip even the most insignificant one (all electrical systems are connected). Now that the battery is running, switch it off and see if the automatic bilge pump float switch works. Properly checking the engine is paramount to de-winterizing your boat. Make sure the oil levels are correct first. If you didn't change the oil before storing the boat for the winter, now would be the time to do it. Don't forget about the outdrive oil, too. Fill or change those as needed. If you flushed out the cooling system before storing the boat, now you can fill it back up with equal parts water and antifreeze. 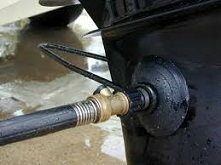 If you left the water/antifreeze mixture over the winter, drain it out, and then fill it. Check the hoses for any cracks or wear, and search around for any visible leakage. Your gas tank and fuel lines are in danger of developing rust during the winter. Hopefully, you filled up the tank before storing it, and no moisture had a chance to settle. However, that doesn't leave out the fuel lines. These lines have a tendency to crack during cold temperatures, so inspect them and replace them as necessary. This step is often overlooked and potentially life-saving. Make sure that your safety equipment is prepared, not expired, and not visibly damaged. Check for the proper amount of flotation devices. Read expiration dates for fire extinguishers. Test all the lights in the cabin and on deck. In case you need it, organize your paperwork, registration and insurance. Check the signaling equipment, such as horns, flares, and whistles. The belts connecting the engines and motors can quickly wear during the off-season. You can check these manually with your hands for tears in the fibers. Push down on the belt slightly to see if there is too much slack as well. If you notice any black soot around the machinery, it may be time to switch out your belts for new ones. If you have outdives, connect the "ear muffs" and water hose to the water intake on the unit. With the water running, start the motors. Be sure the engine is pumping water, this is very important for cooling those engines. With the area clear, engage the throttle slowly forward to check the prop spins. Then check reverse. De-winterizing your boat is an essential part of its life cycle—don't overlook it! Maintaining your boat is what makes your time on the boat most enjoyable. If you don't follow through with each step, you could miss something that costs a lot of money to repair, down the road. But why go through all the work to keep your boat in good condition if you're not even covered for an accident? We can supply you with excellent coverage at competitive rates.